The sorts of changes I have in mind here run along these lines: a long, slow increase of population density relative to available resources; a gradual shift in the gender ratio or age structure of a population; the gradual silting of a river system and estuary; a slow erosion of a traditional system of values; and an extended process of increasing or decreasing tolerance between intermixed religious groups. In each case it is possible for the changes to be slow enough to defy recognition by historical participants; and yet each of these slow processes may have very important historical consequences. Paul Pierson addresses many of the issues raised by slow pace of historical processes in Politics in Time: History, Institutions, and Social Analysis . But in a somewhat different theoretical setting the topic was also of particular interest to some of the historians of the Annales school -- Fernand Braudel and Emmanuel Le Roy Ladurie in particular. We might say that these are examples of historical processes working "behind the backs" of the participants. The question here is a simple one: what are the methods of observation and inference through which historians can identify and investigate these sorts of long, slow processes? And what is the standing of such processes insofar as they stand outside the scope of events of ordinary historical experience? Given that participants have no basis for identifying the long, slow processes within which they swim, what is the status of the historian's hypotheses about such processes? As for the question of how historians can identify these kinds of century-long processes: this task is really no more challenging than the problem of arriving at hypotheses about unseen processes in other areas of science. It takes ingenuity and imagination to hypothesize how a gradual increase in local violence might relate to slow demographic trends; but once the historical demographer turns her eye in this direction, it is no great leap to hypothesize that a rising male-to-female ratio may be a part of the cause (as Valerie Hudson and Andrea Den Boer argue in Bare Branches: The Security Implications of Asia's Surplus Male Population ). What is necessary, though, is a fairly rigorous ability to measure variables of interest at different points in time and to discover trends among these observations. In other words, the turn to cliometrics -- quantitative observation of historical trends -- is more or less essential to the history of the longue durée. And it is not too surprising that the Annales historians were deeply interested in demographic history, price series, and historical measurements of economic activity. So this answers part of the question: a history of long processes requires careful observations of quantities over time, and it requires the formulation of causal hypotheses about how these trends influence other historical circumstances of interest. Jack Goldstone's efforts to link the occurrence of revolution to slow demographic processes falls in this category (Revolution and Rebellion in the Early Modern World ). 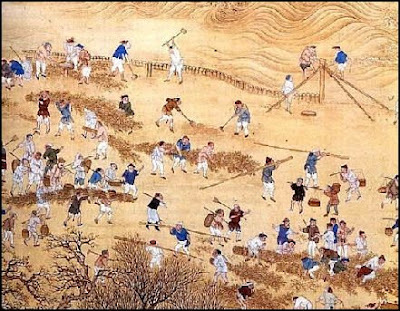 And Mark Elvin's treatment of the centuries-long struggle between officials and rivers in China to gain control of flooding and silting illustrates the historian's ability to take the long perspective (The Retreat of the Elephants: An Environmental History of China ; see this posting on Elvin's work). And what about the other question -- the status of historical conceptions of these long, slow processes? They are not abstractions from the historical self-understandings of participants. By hypothesis, participants cannot perceive these sorts of processes. Instead, they constitute a more hypothetical historical structure that may nonetheless play a future role in the narratives participants tell about themselves. A slow process of climate change may be imperceptible at a given point in time. But once it is identified and articulated by the analytical historian the construct may come into popular consciousness; what was previously invisible may become part of the furniture of the popular narrative. So if we conceptualized historical episodes along the lines of life events, then the longue durée would be forever outside of history. If, on the other hand, we include in our definition of history all the structures and trends that can be identified by analytical history, then the history of the longue durée is entirely comprehensible. Moreover, it is apparent that ordinary historical apperception can itself incorporate the theories of historians. And in this sense, the longue durée can enter back into ordinary historical experience.